The past two weeks have been crazy! Awesome, but crazy! I flew out to Boston on August 19th and visited with my family for a few days in Amherst, NH. We did a big family portrait with my parents, sister, and my brother’s clan. It was great to see everyone – I need to get out there more often to visit! On the 22nd my Dad drove me to Boston to compete in the IBJJF Boston Open. After the craziness that happened last time in Boston with my weight, I made absolute certain I was at least a couple pounds under my weight limit before leaving for the venue in the morning. My first match in a competition is always a bit weird. I won with a pretty good point margin but wasn’t feeling driven to go for the finish like usual (bad Nicholle!). In my second match I won by submission. My third (and finals match) was an awesome battle! 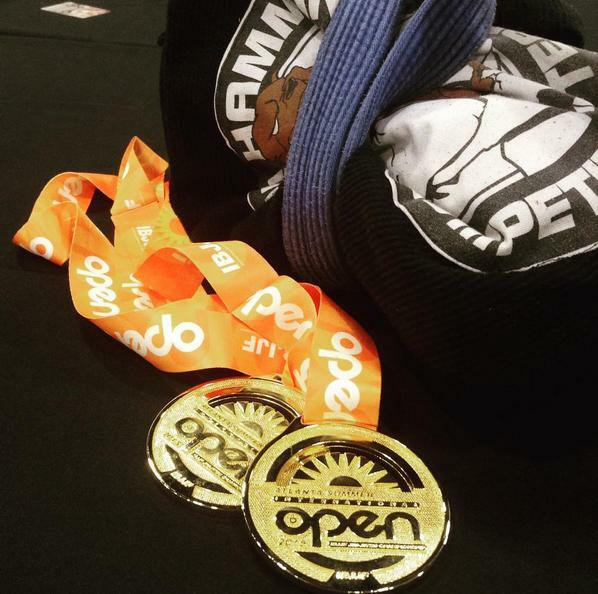 I made the huge mistake of trying a brand new move and ended up getting my guard passed and I lost on points for the silver medal in my weight class. 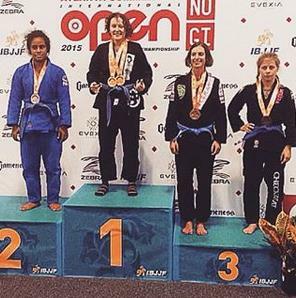 For my first match in the open, I had the ultra-heavy weight silver medalist. I jumped full guard and did well the first half of the match until my guard was passed and I found I was unable to move beyond just enough to prevent a position advance for my opponent. In the end, my opponent was disqualified in the last 10 seconds for stalling. I’m glad I got to advance, but I didn’t exactly win either – so I have very mixed feelings about that. My second match was the semi finals and I got another of the ultra-heavy weight ladies. I pulled guard straight into a sweep but was unable to stick the pass and got put into full guard. I became rather annoyed at attempts to cross choke me across my cheekbones and eyes. I got a stalling warning, stood up, passed, and had a really fun match without getting scored on and ending with a submission. 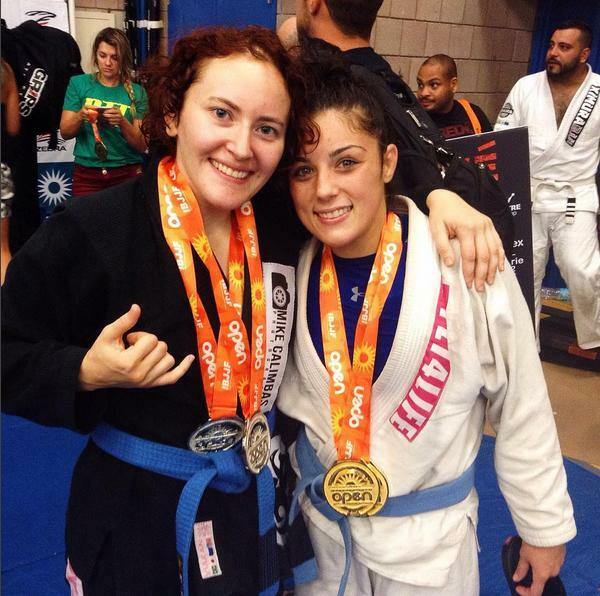 My team mate Roya won her semi finals match against yet another ultra-heavy weight, and I told our coach I wanted to give her the gold since she took gold in her division. (Plus she is awesome and I have yet to be able to score a single point on her in practice.) So I ended up with double silver in Boston! Sunday night (the 23rd) I took an overnight bus from Boston down to Washington D.C. I can usually sleep well while traveling but had major difficulties this time so I arrived in D.C. looking a little worn with just about a 30 minute nap keeping me upright. I didn’t make it to the school in time for morning training so I watched the rest of class. I went across the street to eat and just when my food arrived I got a call from Master Lloyd asking where I was – apparently one of my team mates was going back by the dorm house and was going to drop me off so I could sleep. Since I missed the ride, I took a nap on the mat in the back room. Training was awesome as always and I feel like I’m improving a bit more each time I visit. One of my training partners commented that I felt more compact than I did my last visit. Made it to my hotel a little bit before midnight and crashed out until I had to check out and head to the venue at 9. My division was set to start at 10:40 but ended up being called 30 minutes early. My warm up consisted of slapping my face once at the side of the mat and running out there. I had a training injury limiting my normal levels of mobility, so I opted to jump full guard. The match went for several minutes before I managed to get a submission. My second match was won by submission but I can’t remember how it went and my video malfunctioned… so that will just have to be a mystery! Third match was the finals against a friend of mine and it was shaping up to be a fun dynamic match until her hip dislocated while I was working a straight ankle lock. Apparently it happens frequently so she will be fine after a few days of soreness – but it sucked! So yea, gold in my weight class. My first match was pretty tough and went to a decision. I played guard the whole time but was dynamic enough that I won the decision to advance. My second match was possibly one of my favorites of the day. My training injury was really starting to cause me problems so I resorted to rubber guard control and ended up winning by submission with a bent elbow arm bar (yes, it looked as weird as it sounds). My third match was the finals and I went with the weirdest guard pull/sweep thing I think I’ve done in competition to date. I ended up on top of deep half guard with the under hook. I ended finishing with a wrist lock which surprised and confused my opponent since she had been told wrist locks were not legal moves. It was so good to get back home to Nashville! I miss my home crew and awesome coach, Shawn Hammonds, whenever I am gone for more than a few days. I have just a few more days to enjoy them all before I leave on September 8th for Japan. One of my clients bartered a package deal in exchange for the plane ticket to Tokyo. He and his wife are pretty much set for their next year’s worth of massage appointments – and it’s totally worth it! I booked myself a stay in a well reviewed capsule hotel which includes a bicycle rental. It also has free (consistent) wifi, a ladies only floor with traditional Japanese bath, a rooftop terrace, easy access to metro and food places, as well as a free vending machine that dispenses coffee, tea, and miso soup! Oh yea, and only $20 a day! On the 10th I have been granted a tour of the Imperial Palace after which I plan to visit the Kodokan Museum and watch a Judo class there. I won’t be able to participate since not only do I not have an official judo gi, I will be competing on the 12th and would rather not have any extra sore spots if necessary. The 12th is the Pan Asian Championships in a northern area of Tokyo. I currently have a division of 4 and am crossing my fingers for some more last minute sign ups! Feather weights and under outnumber the light weights and up by almost a 2:1 ratio – so I get to be one of the big she-hulk beasts in the open! On the 13th I will be climbing to the summit of Mt. Fuji. It’s a non-technical climb which means no ropes will be needed. The climb just requires lots of stamina and cardio endurance as it’s a long uphill hike through rapidly thinning air (12,388 ft or 2.34 miles above sea level). Incidentally there is also a ramen shop at the summit along with a post office. I am going to mail a few postcards from the top once I make it up there, after slurping some high altitude ramen! On the 15th I have tickets to the Sumo National Championship Tournament.I actually booked this through a tour company so I will get to have the walk through and an explanation of all the ceremony involved. I fly home on the afternoon of the 16th so I plan to eat one (or 5) last meals before heading for the airport. If anyone has any suggestions of things to do while I am there, please share! I’ve got a check list of things to do (and things to eat!) and will most definitely be taking a TON of photos and videos. I probably will not be spending too much time writing blog posts while I am there, but I may do some photo and/or video blogs!